We all know that when it comes to household electrical lighting, LED lights consume the least amount of energy for a given amount of light, followed by fluorescent tubes, halogens, and Edison-age tungsten-filament light bulbs. We also know that roughly the same ordering applies when looking at endurance; LED's will last until the end of the universe, flurescent tubes will last thousands of hours, etc. We've also all seen the graphs that show how much money you'll save for all of these types of electrical lighting. Looking at initial investment (purchase) and energy consumption over a year, the break-even point when compared to tungsten-filament bulbs lies for LED lights somewhere in the order of ~10-15 months, fluorescent tubes ~6 months and halogens ~4 months. This is all very nice, but this all has a nasty sales-pitch/green-washed marketing aftertaste in all of this; way too much focus is on cost for the consumer, and very little is being said on actual overall energy expenditure. I want to prove to myself and everyone else that LED's are really the way to go. The energy it takes to create a single bulb. See this related question. For example, to create a tungsten-filament light bulb, you need tungsten, glass, some metals, some plastics, a mixture of specific gases, cardboard and plastics for the packaging, ... Extraction/production/transportation of these materials takes an amount of energy per kg. Shaping it into a filament/glass housing/metal fitting/etc. takes an amount of energy, etc. In other words, from the "stuff that's in the ground" to "finished product in the store". I find it very hard to find sufficient details on this subject to be able to do this comparison. I find it hard to believe that I'm the only one thinking this, but I'm just not finding them. Does anyone know some sites or papers I should look into? the life-cycle environmental and resource costs in the manufacturing, transport, use, and disposal of light-emitting diode (LED) lighting products in relation to comparable traditional lighting technologies. The conclusion of both studies basically is that currently the life-cycle energy of LED is more or less the same as that of CFL but expectations are that it will become better and that the LED's life-cycle energy will decrease by approximately one half. i signed up just so i could make this comment. 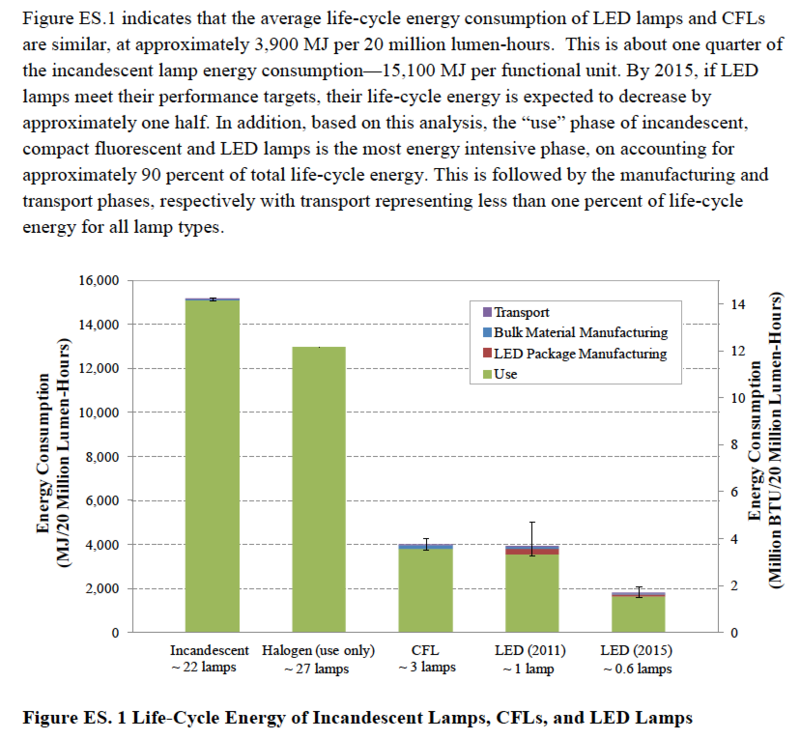 THelper♦ provided a good link to a DOE report on this topic, which i was researching because my roommate is skeptical about the advantages of efficient bulbs. There is a lot of efficiency variation that depends on the quality of the LEDs. Cheap LEDs are no better than CFLs. High quality LEDs from brands like Cree or Philips can be over double the efficiency of CFLs. Also under-powering LEDs will make them more efficient and last longer. They can last indefinitely when underpowered by a certain level. I believe you can also find more detailed info through phys.org (the link throws you in the website with the "incandescent light bulb" tag on). Regarding "state of the art", I would refer you to NanoLeaf (formerly NanoLight). They just completed a Kickstarter campaign with a lot more money than they asked for, and have reviews in several renowned magazines and websites. Not the answer you're looking for? Browse other questions tagged energy electricity ecological-footprint energy-efficiency light or ask your own question. How much heat loss occurs due to unsealed downlights?